We want to stay connected with you throughout the week! Why? Well, let's be realistic, how well do you get to know people in an hour on Sunday at church? You don't! It's not just about a one hour service each week, it's connecting in real relationship with God and with others every day. Wednesday Night Bible Study [more info below] is just one way you can connect with others at Grace In Community Church, but there are many, many more too... check out our other Ministry areas under the links below! ﻿Every Wednesday at 6:45pm, we hold an interactive Bible Study here at Grace In Community Church! Adults of all ages gather for a dynamic and powerful time of Bible Study. ​Have kids? Bring them along! We have a program just for them so they too can study God's Word! If you are a man looking to get connected, check out GICC MEN! If you are a woman looking to get connected, check out GICC WOMEN! If you have teenagers looking to get connected, check out COMMISSION YOUTH! If you have children looking to get connected, check out GICCHILDREN! 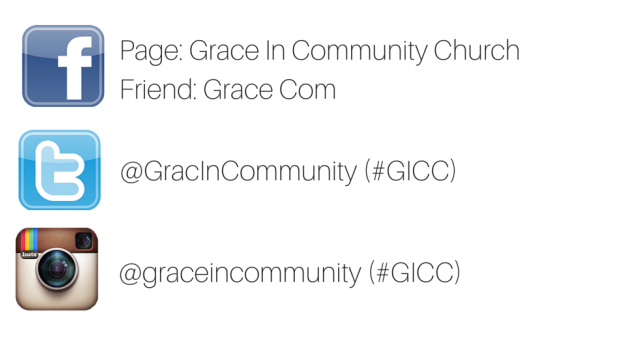 Text GRACEINCOMMUNITY to 84483 to receive our alerts, updates & messages on your handheld device.